On December 20, 1917, less than two months after the October Social Revolution in Russia, the All-Russian Special Commission for Combating Counter-revolution and Sabotage (VChK) was created in the new Soviet Russia. The agency was created by decree of the Council of the People's Commissar (SNK), the government at that time, "for combating counter-revolution and sabotage." The main aim of the commission was the suppression of any opposition to the new regime in any form, and in this case "suppression" very often meant physical extermination of persons who did not approve the regime. In September 1918, the SNK promulgated the decree that came to be known as the "Red Terror." Officially, the red terror was provoked by the increasing activity of the opposition that threatened the emerging Soviet government. The decree served as a basis for purging opposition, however, and punishing perceived enemies of the Soviet power by isolation in concentration or work camps. The VChK began an organized campaign to capture perceived enemies of the state, imprison them, or often, execute them without benefit of a trial. 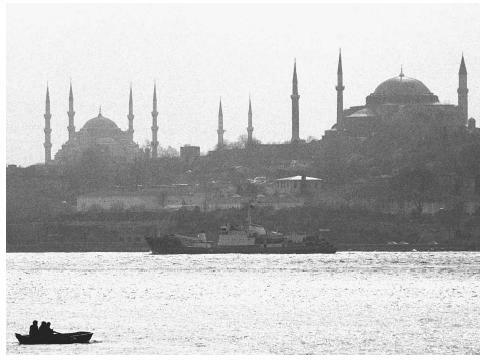 The Liman , center, an intelligence-gathering vessel of Russia's Black Sea Fleet, sails through the Bosphorus Strait in 1999 on a mission to gain information about conflicts among the Balkan states. In February 1922, the VChK was formally abolished, but it was practically reorganized as the State Politic Administration of NKVD, and in November 1923, it was reorganized again as the Joint State Politic Administration (OGPU) of the SNK. Felix Dzerzhinskii, a former professional revolutionary born in Poland, headed these structures until his death in 1926. Compared to the VChK, the OGPU's activities enlarged, as it began to engage not only in problems of internal security of the regime, but also in problems of intelligence and active work abroad. The Foreign Department (INO) was created within the OGPU in December 1920, for the purpose of conducting intelligence and subversive activities in foreign countries. In this work, the OGPU cooperated actively with the Comintern, the Communist International, whose leaders of were in Moscow, and which was under total control of the Communist Party of the Soviet Union. The People's Commissariat of Home Affairs (NKVD) was also organized in 1917 in Soviet Russia to handle the security concerns of the new regime. The country's police force (officially named "militsia") reported to the NKVD. Functions of the NKVD and successors of the VChK often became entangled, and during the period from the 1920s until the beginning of World War II, these two organizations operated both jointly and separately. In 1934, the new "All-Union" People's Commissariat of Home Affairs (known again as the NKVD) was created. The new NKVD included the Main Agency of State Security (GUGB), which was the successor of the OGPU. The new NKVD also included the central agency of Militsia (police), the border and internal guards, and the fire guards. A notorious arm of the NKVD was the main agency responsible for labor camps and deportation, the Gulag. Activities of the infamous Gulag were described in detail in the works of the Nobel Prize-winning Soviet dissident and work camp prisoner Alexander Solzhenitsyn. The Gulag interred millions of political prisoners in camps throughout the Soviet Union, and became infamous for its cruel methods of suppression. 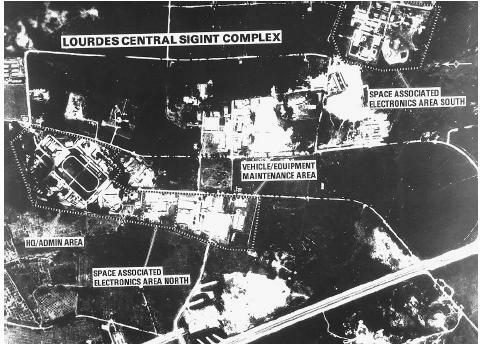 The Kremlin learned of U.S. battle plans for the 1991 Persian Gulf War through its electronic spy network based in Cuba and known as Lourdes, seen in this photo taken by a U.S. spy plane. crimes against the state. Almost half of those arrested were executed by gunfire. Although acting under direct orders from Stalin, this period is often referred to as "Ezhovshina," meaning Ezhov's time. Eventually, Ezhov himself was arrested and executed, as Stalin grew suspicious of Ezhov's knowledge and tactics. Ezhov was replaced by Lavrenti P. Beria, who served as the head of the NKVD, along with other Soviet security agencies until 1953, when Beria was arrested and shot for attempting to gain power after the death of Stalin. The Great Terror continued under Beria, with the numbers interned in the Gulag work camps estimated between 4 and 20 million by the end of 1939. Also before World War II, Soviet intelligence gave serious attention to suppressing political enemies of the regime. Probably the best-known example of such activity is the assassination of Leon Trotsky, the main political enemy of Stalin and one of the leaders of the Russian Revolution. Trotsky was deported from the USSR in 1929; he roamed from country to country seeking political refuge, finally settling in Mexico. Soviet secret services tried to murder him several times according Stalin's order. At first, the Russians used Mexican communists in the attempts to murder Trotsky. In one such attempt, the famous Mexican painter David Siqueiros participated. A group of Mexicans with machine guns riddled Trotsky's bedroom with bullets one night, then escaped, assuming that Trotsky was dead. Trotsky and his wife, however, were alerted, and hid safely under the bed. After this assassination attempt, Trotsky supporters guarded his home. Finally, the Russian NKVD agent Ramon Merkader befriended Trotsky's secretary, and through her unknowing confidence, gained access to the Trotsky home carrying an ice-axe, and carried out the assassination of on August 20, 1940. The Komitet Gosudarstvennoy Bezopasnosti (KGB), or Committee for State Security, was the primary organization during the Soviet period for intelligence and counterintelligence matters, although it often played a role in maintaining domestic security alongside the NKVD. In the years of the new Soviet Republic before World War II, some people in Western countries supported communism and cooperated with the KGB for ideological reasons. One famous example of such cooperation is the case of the "Cambridge five." Soviet intelligence drew upon the sympathies and cooperation of five students at Cambridge University (Kim Philby, Donald McLean, Guy Burgess, John Carincross, and Anthony Blunt) to recruit them as spies in the 1930s. After World War II, several members of the spy ring attained key positions in the British intelligence service, where they gained access to many of Britain's most guarded secrets. Led by Philby, components of the spy ring fed Western intelligence secrets to the Soviets for over a decade after the war. After they were exposed, MacLean and Burgess defected to the Soviet Union in 1949; Philby escaped detection and functioned in his role as double agent until 1963, when he also defected and became a colonel in the KGB. Both Blunt and Carincross escaped detection and remained in Britain until the 1990s, when they were exposed by the British government. During World War II, the activity of all Soviet intelligence and secret services became much more active; old agent ties were restored and new ones were created. Counter-intelligence and strategic data connected with the war activity were obtained. After the end of the war the "atomic espionage" began. And along with this, the concentration camps continued to exist in the country, and new repressive tasks appeared. Stalin, for example, ordered the exile of entire nations (e.g., the Crimean Tartars, the Chechens), and this order was executed strictly. Activities of the Soviet secret services remained acute after World War II. In 1954, the famous State Security Committee (KGB) was again created after reorganization, which conducted intelligence and repressive activities along with other information gathering. The head of the KGB enjoyed an important position in the totalitarian regime hierarchy, and one, Yuri Andropov, even became the head of the Soviet state. KGB leaders played an important role in the attempt to overthrow the government of the first (and last) president of the USSR, Mikhail Gorbachev, when they isolated Gorbachev in the Crimea for three days during his vacation in August, 1991. The KGB was essentially abolished after the failure of the anti-Gorbachev putsch and the collapse of the USSR in 1991. The following agencies were created from within the KGB: the Federal Security Service (FSB); the Federal Agency of Government Intercommunication, which is responsible for communications between top state officials; the Guard Service, which guards top state officials; and the Outer Intelligence Service, which collects and processes all data coming from abroad. Immediately after the Red (Soviet) Army was created in the early twentieth century, its own intelligence was organized, and by 1917, the Department of Agitation and Intelligence of the General Staff was operational. With the increasing power of the Army, its intelligence strengthened, and before World War II, the Intelligence agency of the Red Army was formally organized in 1934, and later reorganized again into the Main Intelligence Agency (GRU). The Soviet Army Intelligence existed until the collapse of the USSR, and today exists in the Russian Army. In the end of the Soviet epoch, this Agency was the most powerful intelligence structure, and executed different tasks of both strategic and operative intelligence with large networks of agents abroad and representatives in practically in every Soviet embassy. The GRU had its own dedicated troops and unofficially competed with the KGB for power and prestige in the Soviet government. Janseen, Marc, and Nikita Petrov. Stalin's Loyal Executioner: People's Commissar Nikolai Ezhov 1895–1940. Palo Alto, CA: Hoover Institution Press, 2002. Knight, Amy. Beria: Stalin's First Lieutenant. Princeton, NJ: Princeton University Press, 1996. Waller, Michael J. "State within a State: the KGB and its Successors." Perspective IV, 4 (1994). Federation of American Scientists, FAS Intelligence Resource Program. "Soviet/Russian Intelligence Agencies" < http://www.fas.org/irp/world/russia/ > (April 18,2003).